How to add a video to your Local Cache? 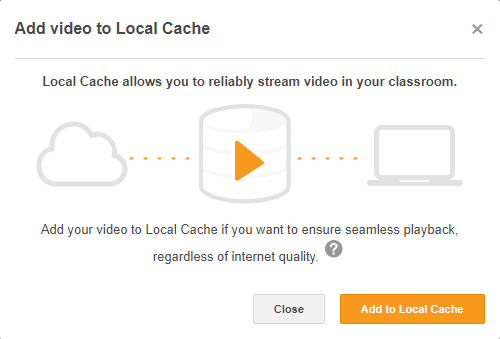 There are two different methods to cache a video in Local Cache. 1. Passive: Playing any video in ClickView, when you are on the same network as your Local Cache, will cache the video. If the video already exists in the Local Cache, the video will be streamed directly from the Local Cache without using any internet. You will know when a video is being streamed from the Local Cache by the icon in the bottom right hand corner of the ClickView Player. 2. 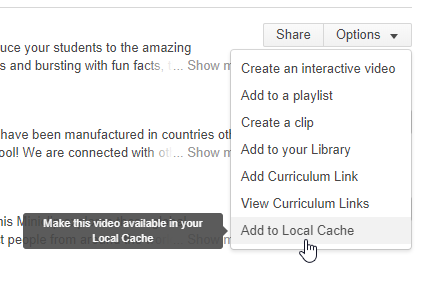 Active: You can actively push titles to your Local Cache, in preparation for the next lesson or next days lessons, via the Options button on any ClickView video. And click on `Add to Local Cache`. This will add you video to your Local Cache so that it can be played reliably in your classroom!